Original Brite Site, into archery's first rest with both a vertical and horizontal MICRO Klik adjust. 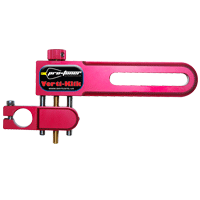 Add the VERTI-KLIK Mount to your Pro Tuner, and enjoy the same great features in a verticle dimension. the flight of your arrow. you make are the settings you keep! No tools required. Fits any bow. Sold separately or with the Pro Tuner.